Authorities in Singapore have seized more than 28 tons of pangolin scales in a record-breaking haul that’s bringing renewed attention to the plight of this unique little mammal. Pangolins, who live in Africa and Asia, are toothless insectivores, and they’re the only mammal on earth covered in true scales. Sadly, they’re being hunted to the brink for their meat, which is considered a delicacy, and for their scales, which are believed to have medicinal properties – even though they’re made of nothing more than keratin like our fingernails. 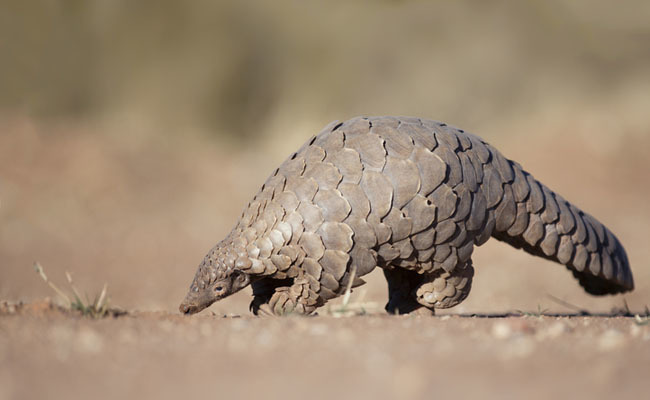 It’s estimated that the demand for their parts, which is heavily driven by China and Vietnam, has resulted in more than 1.1 million pangolins being trafficked around the world over just the past decade – which breaks down to one pangolin being taken from the wild every five minutes. Even though this threat has gotten them the unfortunate distinction of being dubbed the most heavily trafficked mammal on earth, they’ve received far less attention than many other species at risk. Unfortunately, another massive seizure of pangolin scales in Singapore is drawing new attention to their plight. In just a week, officials seized more than 28 tons of pangolin scales headed from Africa to Vietnam. The National Parks Board, Singapore Customs and the Immigration and Checkpoints Authority first discovered a record-breaking shipment 14.2 tons of scales hidden among packets of frozen beef on April 3, and then another 14 tons labeled as cassia seeds just days later on April 8. According to the Associated Press, the total haul represents more than 38,000 individual pangolins. Even though pangolins were given the highest level of protection from international trade in 2016, they’re still clearly being threatened by traffickers and pushed closer to the brink of extinction. Hopefully the latest seizures will help raise even more awareness about these fascinating creatures, and the urgent need to increase enforcement efforts to protect them from the illegal wildlife trade before it’s too late. For more on pangolins and ways to help, check out the IUCN Pangolin Specialist Group. Over 38,000 pangolins killed just to cover the number of pangolin scales that were now confiscated. In most airports, specially trained dogs are used to detect drugs. Okay, I admit that drug traffic must be tackled in a serious way as too many young people die from the abusive use of them every day. But let me ask you: are endangered species of animals less important than certain humans, who choose themselves to use this poison?? These pangolins, the elephants and many other wildlife animals are killed on a daily basis, just because some people think they have special medicinal power. I wonder what the Chinese did say 1,000 years ago when no ships cld bring these "miraculous" articles to China. They did survive without them or not ?? Why can they not live without them now?? Am I such a moron or has anybody a decent answer to my question. As long as there are not more and good inspections either in the airports or in the harbors, this smuggling problem will continue to exist. Billions of $, â¬ and other currencies may be spent to protect the animals in their original countries and all the billions that are spent for special breeding programs are WASTED money as long as the borders are not SAFE!! This is a GLOBAL problem and unless very severe measures are taken, a lot of beautiful wildlife animals will go extinct before our eyes!!! The biggest problem is not the poachers, it's the market. Consumers and merchants are going to drive elephants, rhinos, pangolins, et al to extinction. Of course, even worse is the loss of habitat. Just too many humans. @Muriel Servaege ~ERRATUM: there'll be none left to poach and make money. But can those morons think?~ They're probably thinking that the dwindling population of pangolins will drive the prices even higher. We've seen this occur with the yellowfin tuna , where a single large fish can fetch thousands of dollars from the sushi market. This is all about the "I'm gonna get mine while I still can" mentality. Maybe we should all keep our fingernail and toenail clippings and send them to China for their stupid medicine. I am really sad about what has happen to the pangolins they are so beautiful and now they are killed and used for stupid things because or outdated beliefs ! We know what countries are doing this and the haul is seized but its still NOT enough and still it will keep happening . Everyone involved in this crime should be sent to life in prison and it should mean for LIFE ! This is so horrible and heartbreaking. China is the worst. Those horrible Asians are disgusting with their stupid medicinal beliefs.